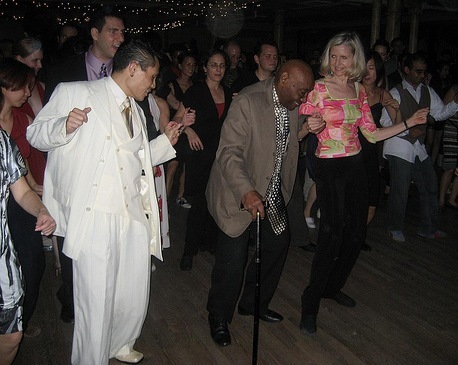 Me dancing the Shim Sham with Frankie Manning at Yehoodi's 10th Anniversary Party in 2008. Photo by OpeningMinds. In just a couple of days, lindy hoppers from all over will be descending on New York City for the swinging-est birthday party ever. The Frankie Manning 95th Birthday Festival will be notable not only for the 2,000 or so guests in attendance, but also for the one guest missing: Frankie Manning himself. Sadly, just a few weeks shy of his actual birthday on May 26, Frankie passed away peacefully at a local hospital due to complications from pneumonia. The next days are going to a whirlwind of activity celebrating Frankie Manning. So I thought this would be an appropriate time for me to reflect on how he impacted my life personally. For my non-swing friends who don't know of him, Frankie Manning was arguable the last great swing dancer from the Jazz Age of the 30s and 40s. As part of the incomparable Whitey's Lindy Hoppers, Frankie was a true innovator of the dance — creating the flashy moves and gravity-defying aerials that inspired a nation-wide movement of swing dancers. He danced in several major motion.jpgctures, notably "Hellzapoppin," performed for stage productions, won national dance championships, and wow'ed audiences around the world. And then came World War II. Like so many of his generation, Frankie was drafted and shipped off to Europe. Once his tour was up, Mr. Manning returned home to find that musical tastes had changed, and that dancing shifted from something couples did to jazz music to the wilder solo gyrations of early Rock n' Roll. Frankie spent the next few decades working in obscurity as a postal worker, his co-workers never knowing that he had danced for kings and movie stars. As he entered his 70s, it seemed like Frankie Manning would just fade away, simply a footnote in a short-lived dance fad. Then in 1984 Erin Stevens and Steven Mitchell, a couple of young swing dancers from California, tracked down Frankie and got him to teach them some of his steps that they had only seen on old videos from the 1940s. Soon, other swing organizers were flying out Frankie to teach their dancers the original steps, and Frankie began his second career as an "Ambassador of Lindy Hop." It's not an overstatement to say that Frankie Manning over the past 20 years inspired a whole new generation of thousands of dancers around the world, from Singapore to Melbourne to Stockholm to Buenos Aires. Every week, at most any swing dance you attend around the country, at some point someone will call for a "Shim Sham," and we'll all dance the "Shim Sham Shimmy" line dance that Frankie taught us. Beyond the steps, Frankie Manning taught us how to be better people, not just better dancers. He taught us guys that being the "leader" meant appreciating the "queen" that we had the privilege of dancing with, letting her shine. And he taught the ladies that "following" didn't mean passively aquiescing to the will of the leader, but that each dance was an equal exchange, a partnership. He taught us to dance with joy and with passion, bouncing to the syncopated rhythm that defines swing. I am one of the lucky few who has had the privilege of being on friendly terms with Frankie, due to several serendipitous occurrences. Back in 1999, I attended a special workshop with Frankie Manning at the Sandra Cameron Dance Center. I remember Frankie just putting on a slow-ish swing song and asking us to dance so he could get an idea of what he was working with. At that point, I had been dancing for about a year, and was struggling to master the swingout, a foundational move of lindy hop. Frankie took me aside during class and said quietly, "Son, I don't know what style that is. But we're not doing that kind of swingout in this class." Frankie helped me realize that I was being too forceful in my lead, basically pushing my partner where I wanted her to go. Frankie's style emphasizes inviting your partner to do a particular move, creating a path for her, and then letting her decide on how she wants to travel it. It took me years to learn that. A few years ago, I was invited to participate in Frankie's semi-private "master" classes that he taught with a dozen of his veteran students. It was a great honor spending a few months learning directly from the man. Even more important were the dinners we shared, almost always at some terrible Tex-Mex restaurant where Frankie always got arroz con pollo. Getting to hang out with Frankie, share jokes, and break bread (or tortillas) with him was such an honor for me. Then in early 2007, I was contacted by Cynthia Millman, longtime friend of Frankie's, who told me that she and Frankie were about to publish his autobiography that she co-authored. I was asked if I wanted to help with the marketing of the book to the wider swing world, using the various social media tools that I knew about. I told Cynthia I would be delighted to help. I would like to thank all you guys, you ladies and gentlemen, for buying the book and making this the best birthday present I've ever gotten. I want to thank you from the bottom of my heart, and hope that you enjoy reading the book of my life as much as I enjoyed living this life. My heart just leapt reading that. My last substantial interaction with Frankie was at Yehoodi's Tenth Anniversary Party in October 2008. Frankie had been having health problems, particular with his hip replacement, and wasn't getting around very well, much less dancing. But he promised us he was going to try to at least attend our main dance. I frankly didn't expect him to show up. But that evening, there he was at the head table, chatting with folks and greeting me when he saw me. I told him that it meant a lot to us that he showed up that evening. He replied that he wouldn't dream of missing a Yehoodi party. At some point in the evening, the song "Tain't What You Do" by Jimmy Lunceford came on — one the traditional songs that the "Shim Sham" line dance is performed to. With the help of his cane and his friend Margaret Batichiuk, Frankie walked to the front of the line and led us, once again, in the "Shim Sham." I happened to be toward the front of the stage, so I got to dance the "Shim Sham" beside my friend and inspiration Frankie Manning. It was a glorious moment and one of the highlights of my entire dance career. And now Frankie is gone. My heart still grieves a little. I feel like the world is a lesser place with him gone. But I also feel so lucky that I got to learn from Frankie, hang out with him, dance with him. He has taught me to dance with joy, to appreciate each person I swingout with, and to believe in second chances. It's going to be an amazing birthday party.